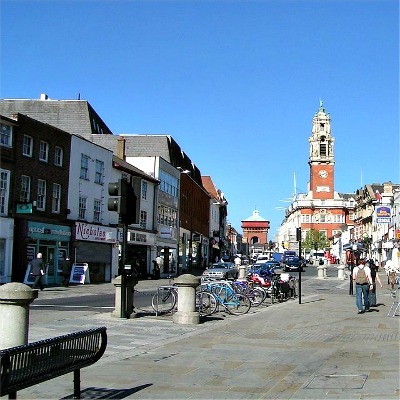 The haunted streets of Colchester are filled with history, with the town being the oldest recorded Roman town in Britain which has also led to the title of Colchester being the oldest town in all of Britain. It has seen constant growth in its time, ever since it acted as the Roman capital of Britain, and today it is known as one of Britain fastest growing towns, as well as being a member of the "Most ancient European towns network". The amount of history in this area is simply immense. In recent years a number of Acheulian hand axes were found in deposits beneath the town, and after date testing was complete they were estimated to be as old as 1.5 million years. There are very few places on earth which can present evidence as old as this to prove people, or at least someone was living there. The town has seen many occupations and architectural influences in its life, starting off with roman influence for its first "permanent" structures, then having everything from viking, Norman and colonial type buildings. Many battles, both well recorded and those so ancient they will be forever lost in history have happened here, creating the foundation for a huge number of possible hauntings. The town is very proud of its history and its ghostly inhabitants and there are various ghost tours available within the town, and since it is of course open to the public you are free to explore its haunted streets whenever you please. Make sure you have a look at the castle if visiting the area, even if you don't see any of the spirits which still linger there it is still well worth seeing. Colchester has always had a military presence since the days of Roman rule, and today it has a garrison which is currently home to the 16th Air Assault Brigade. This may be the reason that so many people have reported seeing apparitions of military personnel, with claims of everything from roman soldiers to English civil war troops. Before its documented history began in Roman times during the 2nd century, it was inhabited by the Celts. The Romans killed the resisting population and claimed the land as their own. Such a brutal sacking of the native population is thought to be the reason that many of the spirits seen appear to be of Celtic warriors, often seen in very primitive dress, and with traditional war paint across their bodies. The main hotspot for the town is definitely the castle, which holds many of its own ghostly tales and resident spirits. Click the link if you would like to read more about the hauntings of Colchester castle. As for where you can find ghosts in the town itself i cannot say more than they are simply everywhere. The amount of buildings which have been replaced by more recent structure is huge and spirits are known to often move from the building which doesn't exist anymore into the one which now occupies the space. This is one of the many reasons it will forever remain impossible to identify many of the spirits which remain in the area. One of the towns shoe shops is claimed to be home to a "white lady" and yes i know, everywhere has one. There is a story about a woman who used to work there who claims one day she saw a woman in the stock room wearing a long white dress, who disappeared shortly after she entered the room. Also footsteps coming from empty areas and shoes and box's falling off the shelves on their own caused the woman to promptly find another job. If you walk the haunted streets of Colchester for long enough you are sure to find something paranormal, whether it is one of the castles spirits or a past resident of the military prison known as "The Glasshouse" on the edge of town, you surely wont be disappointed at how haunted this ancient and beautiful town is.